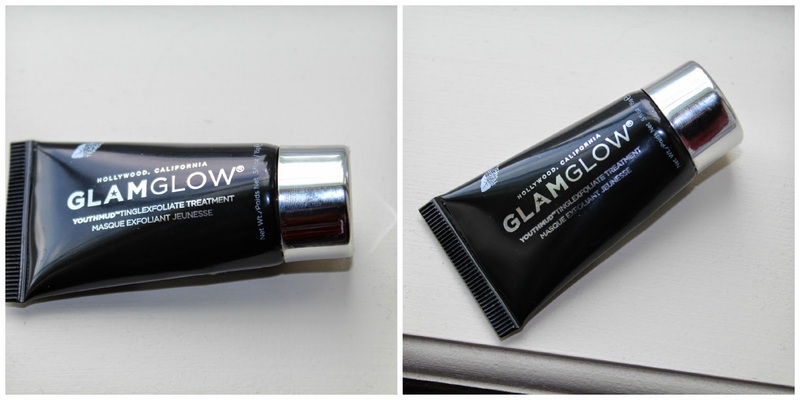 GlamGlow is a high end face mask that everybody has been raving about. So of course I really wanted to try it. But with a price tag of $69.00 for less that 2 oz., I never did. As some of you may know I subscribe to monthly beauty boxes that send high end deluxe samples that I probably wouldn't otherwise try. The first time I had this product I waited awhile to use it. Then once I got around to using it I thought it had spoiled so I tossed it out not evening thinking. And then just the other day I tried it again, and the product was just like the tube that I thought had gone bad. I didn't realize that it had leaves and grainy bits I just thought it had been sitting to long and was drying out. The first thing I noticed was how thick and full on grain it was. I didn't like the way it applied. It was very hard to spread. Also the leafy bits just seamed gross. I don't know why but I feel like a mask should be an enjoyable experience and for me this product didn't do that. Once I let it sit for 10 minutes I tried to remove it with a warm wash cloth. Those grainy pieces were stuck all over and just wouldn't come off for anything. It was rather harsh and left my face feeling raw. It even left a small welt. I truly believe this product is over hyped. I would never re-purchase this nor do I really want to try any of the brands other products do to the price, I wouldn't want to pay full price and have a similar experience to this one. For the money you can find much nicer masks.